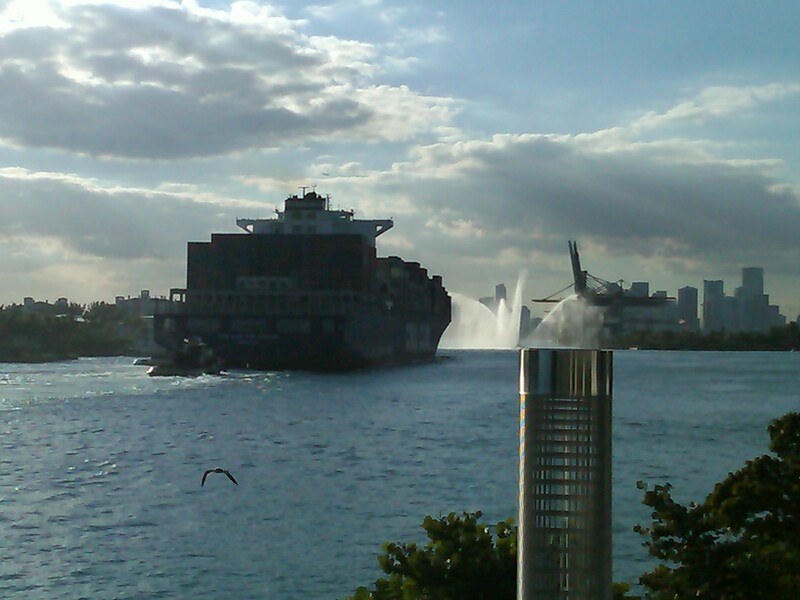 Preview What’s in Store for Port of Miami After Panama Canal Widens! (Miami-Dade County, FL) — The CMA CGM Don Carlos, a 8,500 TEU container cargo ship-nearly twice the size of the average cargo vessel operating at the Port of Miami, will arrive here on Sunday, November 14, as a “test run.” The ship represents the new generation of mega-sized container cargo vessels that have the potential to drastically change cargo operations at the Port. “This ad hoc call of CMA CGM DON CARLOS in Miami helps insure that the Miami Port is ready and has all infrastructure needed to welcome this size of vessels (8,500 TEU), which will become the new minimum standard – once Panama Canal enlargement is completed in 2014” explains Jean-Philippe Thenoz, VP North America Lines at CMA CGM. The ship is expected to arrive at the Port of Miami at approximately 4 p.m. on Sunday. The public can view the vessel from a number of vantage points including South Point Park on Miami Beach. CMA CGM, the third largest container shipping Group, operates the CMA CGM Don Carlos on a routing that includes stops in Japan, China and South East Asia to the United States East Coast via the Suez Canal, and South East Asia, China and Korea to Pacific North West and Canada (Vancouver). The average container cargo vessel now operating out of the Port of Miami is 4,500 TEUs compared to the 8,500-plus Post-Panamax ships. The larger ships require deeper water than the drafts at most U.S. East Coast Ports. The CMA CGM Don Carlos will not be carrying a full load when it arrives in Miami following stops in New York and Norfolk, Virginia. The Port of Miami is currently seeking $75 million in federal funding to move the project forward. The Army Corp of Engineers is expected to complete preliminary design and engineering work for the project next summer. To gear up for the new generations that will traverse the expanded Canal, the Port of Miami plans to invest more than $2 billion in infrastructure improvements over the next decade. Projects include the Port Tunnel, now underway in partnership with the Florida Department of Transportation and City of Miami, along with improvements to the Florida East Coast Railway tracks linking the Port with the Hialeah Rail Yard and the national rail system. The Port recently received $23 million in federal economic stimulus funds for the rail project.